Luchino Visconti was a director whose career appeared to embrace many contradictions. How did the progenitor of Italian neorealism, with its emphasis on naturalistic mise en scene, eventually turn towards making grand, operatic costume dramas? Salvador Dali described him as “a Communist who only liked luxury”; how could a man who held strongly Marxist beliefs also so fervently defend his own aristocratic stock? And why were his films, whose adaptation from historical and literary sources might appear to be what Truffaut contemptuously labelled cinéma de papa, so praised by André Bazin and the Cahiers du cinéma crowd? These questions are raised when watching The Leopard, but so too are they answered. In order to more fully understand why, though, we must tell not only the story of the film and its relationship to the director, but also the source novel, its author, and first to the political events which provide its backdrop. The historical period in question is the Risorgimento, the series of conflicts which led to the formation into a single political entity of the Italian peninsula, and specifically within this the events of 1860 which eventually saw Garibaldi’s army, aided by local militias rebelling against the ruling Bourbon monarchy, annex the island of Sicily, allowing them a march on Naples. Author Giuseppe Tomasi was born in Sicily in 1896 into an aristocratic family, inheriting the title of Prince of Lampedusa on the death of his father some 36 years later. In 1958, a year after his death, what would be his only novel, Il Gattopardo, was published; in the book, a Sicilian prince not unlike the author but living some one hundred years earlier witnesses the profound political upheavals brought about by Garibaldi’s invasion with a mixture of sadness and bemused detachment. The book proved to be divisive: derided by the Left as an apology for imperialism, criticised by conservatives for its portrayal of a corrupt self-serving Church, but loved by just about everyone else for its sensuous, languorous prose, it went on to become an international bestseller. Who better to adapt the novel for the screen than Luchino Visconti? Like Lampedusa, he had been brought up in a noble household, albeit at the northern end of the country in Milan, but one who could well empathise both with Lampedusa himself and his literary protagonist. True, he had made his cinematic name with the realist likes of Ossessione (1943), La Terra Trema (1950) and Rocco e i suoi fratelli (1960) but so too had he demonstrated his ability to stage opulent historical drama in the spectacular Senso (1954). In fact, in a similar way to how Ingmar Bergman is remembered in Sweden as equally for his theatre work as his film output, in his native country Visconti was just as noted a director of grand operas as man of realist cinema. Opulent is something of an understatement in describing the film; The Leopard is firstly and most obviously a feast for the eyes. Shot by cinematographer Giuseppe Rotunno, who would later go on to film Fellini’s kaleidoscopic masterpiece Amarcord (1973), the full splendour of the Prince of Salina’s many palazzi is brought dazzlingly to the screen: gold-lined interiors flanked by countless paintings, sculptures and ornate pieces of furniture, and the lavish feasts and ceremonies the populous court he holds partakes in, all rendered with Visconti’s famous visual perfectionism, and underpinned by Nino Rota’s sweeping score. A life of absolute luxury, but one is stark contrast to the brief glimpses of the poverty suffered by ordinary Sicilians, and one now under threat from the bands of revolutionary armies sweeping through the lands. The threat is not just from below, but from a new estate, personified by the ambitious Don Calogero: nouveaux riches of less-than noble birth whose wealth threaten to eclipse and even to engulf those of the established landed gentry. The Prince seems aware of this decline in his prestige, but remains passive to them; his favourite nephew Tancredi, by contrast, is an active Garibaldini, more aware of which way the political winds are blowing. He and the Prince’s own daughter Concetta are expected to marry, but when Calogero’s beautiful daughter Angelica is introduced to Tancredi, the Leopard must decide whether to sacrifice his familial line and allow old prestige, modern politics and new money to be joined in order for all of them to survive. While witnessing these profound changes, there is also perceptible an increasing awareness on the Don’s part of his old age and inevitable eventual death. What is so delicately explored is the correlation of his political and physical mortality, seemingly personified by Angelica: he is drawn to her beauty himself, yet while for a man of Tancredi’s generation to marry the daughter of a nouveau riche is a politically astute move, wedding a non-noble for one from the Prince’s previous generation would have been unthinkable. And so, the personal fate of one man is shown to be inextricably influenced by the wider historical circumstances, and even a man of the Don’s considerable power is helpless in such a situation. The Leopard was released in 1963, at a time when European cinema was once again becoming explicitly politicized; not just the exploits of the nouvelle vague in France, but so too in Poland, Spain, the UK, and most significantly a crop of post-Neorealist Italian films by new directors: Francesco Rosi’s Salvatore Giuliano (1961), Bernardo Bertolucci’s La commare secca (1962) and Pier Paolo Pasolini’s Accattone (1961) and Mamma Roma (1962). In this context, why was professed Marxist director Visconti making an historical epic, what looks to be misty-eyed nostalgia for his feudal ancestry, now something of a relic in the politically divisive scene of 1960s Italy? How does this fit in to his oeuvre of socially-committed films? The answer is in the source novel as much as it is in the film. In Lampedusa, though significantly not filmed by Visconti, we flash forward in the final chapter fifty years to see the Salina household decades after the Prince’s death. The palace is a relic, haunted by its grandiose past, yet outside of it the ordinary people of Sicily are no better off than they were before. For many, the Risorgimento was a failed, compromised revolution, a triumph of the bourgeoisie, the third estate who would replace the aristocracy as the oppressors of the masses, a theme already explored by the director in Senso. 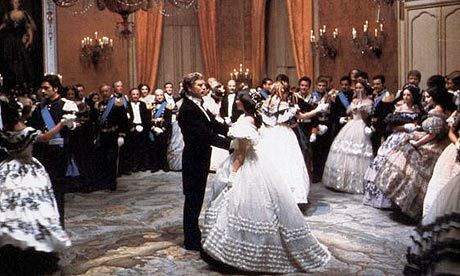 For dramatic flow, Visconti leaves this final chapter out of his film in order for it to concentrate more on the Prince’s view of his own mortality, but the politics are still there; in many ways the spectacular final ball sequence, lasting some 45 minutes, forms as political a denouement, where the demise of the aristocratic order, personified by the Prince, seems silently to unravel before our very eyes. At times both the novel and the film dare to suggest that the old feudal system was much better for ordinary folk than what followed – a position sure to infuriate professional intellectuals, and one which surely only the likes of Lampedusa and Visconti would try to defend. The over-the-top vulgarity of Don Calogero as played in the film shows that while Lampedusa may have a little respect for such a Machiavellian creature, Visconti has little but scorn. Visconti, then, is politically engaged like his contemporaries, but so too in his own idiosyncratically contradictory way, much like Pasolini and Bertolucci were in their own ways. With Visconti there is something of a commonality with Jean Renoir, the great French director under whom he served his apprenticeship as directorial assistant on Toni (1935) and Partie de campagne (1936). Renoir’s twin masterpieces, La grande illusion (1937) and La règle du jeu (1939) both examined the mores of the higher classes with a certain degree of sympathy. So too is there an aesthetic debt to Renoir. Those interiors shot in deep-focus, those carefully controlled gliding camera moves, the painstaking attention to spatial arrangement of mises en scène all bear the hallmarks of the French master. The interiors of the Prince’s world are more obviously lovingly rendered, but it must not be neglected how much the exteriors are too. Two years earlier, cinematographer Gianni Di Venanzo had brought the stifling heat and beautiful if oppressive landscape of Sicily to life in the black and white of Francesco Rosi’s Salvatore Giuliano, and here that is built upon in colour by Rotunno in a series of stunning outdoor scenes. In particular, the morning after the plebiscite on unification we see the island, so much a character in itself in the book, awakening under a literal new dawn, if not a metaphorical one. That same day, the Prince and the accountant Don Ciccio, discuss the new political situation, all framed by the golden mountainous landscape stretching as far as the eye can see. “That America of antiquity” as Lampedusa describes it – do they not recall cinema’s similar renderings of the barren, hostile American West? Aptly, Sicily will later serve as such for the Andolinis and Corleones when Francis Ford Coppola films it in those greatest of American films, The Godfather (1972) and The Godfather Part II (1974), films not by coincidence scored too by the peerless Nino Rota. Another Italian-American, Martin Scorsese, marvelled at Visconti’s use of colour, borrowing heavily from it for his own The Age of Innocence (1993). But as Peter Bondanella suggests, the lavish visuals are always in danger of overwhelming the film’s politics; perhaps this is why it is not embraced as widely as it should be. The reason, for me, why The Leopard is so important to understanding Visconti as a director is illustrated by comparing it to his more internationally famous Morte a Venezia (1973). In that film too we have an ageing aristocrat in fin de siècle Italy, obsessed with beauty and his own decay; here Gustav von Aschenbach attempts to transpose this into his music, while Don Fabrizio seeks refuge through the lens of his telescope, observing the celestial motions above him which care not for trivial earthly matters. In the face of death, both men reject traditional religion for something other, a mathematical perfection of sound or light. Like The Leopard, Morte a Venezia is beautiful to look at. But the later film is overly stylised, and an emotionally cold film, when by contrast, there is a warmth and pleasure in watching The Leopard, even amidst the introspection. Visconti’s class identification with the Prince, I think, is the key to this. The tragedy of Von Aschenbach’s demise when it comes is less than that of Don Fabrizio’s implied death because he is so detached a character, obsessive like the director, but remote from the world around him; Don Fabrizio, though, is aware of his situation but helpless to change it. The Leopard‘s marriage of the epic and the personal is what makes it Visconti’s most affecting work.